The Luminous Dead is a scifi/horror novel by Caitlin Starling. I absolutely loved The Luminous Dead. It's so rare for me to pick up a book, be immediately hooked, and stay that way through the entirety of the novel. The Luminous Dead is 432 pages, and I would have had no problem reading it in one sitting if life wasn't in the way. Even with life I was able to knock it out in 2 days. I did not want to put it down. The Luminous Dead is Caitlin Starling's debut novel. Caitlin Starling is now on my autobuy list. 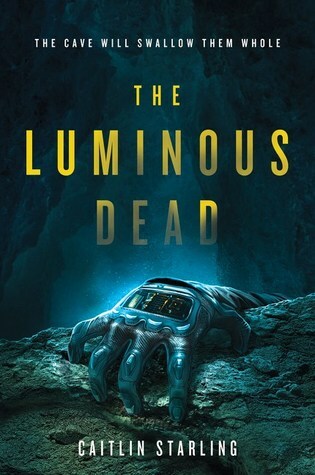 The Luminous Dead only had two characters and one setting for the entire book, and yet I was riveted. The cave setting was the perfect setup for psychological suspense. It wasn't as horror heavy as I was expecting it to be, but I loved the constant sense of dread. 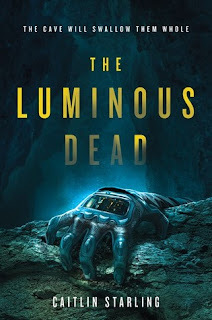 The Luminous Dead is one of my favorite reads so far this year, and I highly recommend it! I'm so thrilled you loved this one since I just got a copy. And how dare life get in the way! Oooh, I hope you love it, too. You seem to love character driven stories like I do so I have high hopes for you, Tammy! This didn't really work as well for me, but I'm glad you enjoyed! I think I expected it to be creepier, but like you said, it wasn't very horror intensive. The blurb for this one was pretty misleading. YAY!! I cannot wait to give this one a read.